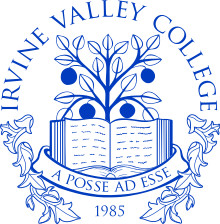 Irvine Valley College (also known as IVC or Irvine Valley) is a community college in Irvine, California. It is part of the California Community Colleges System. The college inherited its name from the Irvine family and the Irvine Company that were key in the development of the city of Irvine. Opened in 1979 as Saddleback College North Campus, Irvine Valley College received its current name and independent status in July 1985. In July 1988, the college received its first accreditation as a separate institution by the Western Association of Schools and Colleges. The school provides two-year associate of art and science degrees, certificates of achievement, and lower-division transferable courses to other colleges and universities. It is a mid-size college campus having over 14,000 students. It is situated northeast of the University of California, Irvine and adjacent to the Irvine Spectrum Business Sector. It is less than 2 miles away from the 5 Freeway, the 405 Freeway, and the Irvine Spectrum Center. The school is also about 10 miles from Corona del Mar State Beach, Balboa Island, and Laguna Beach. The college is funded by a combination of state and local tax dollars, supplemented by private donations from individuals and corporations via the college's foundation. Students are allowed to see the different clubs on campus by visiting their booths. Prospective high school seniors allowed to visit the campus and learn about the many academic paths available to them. Since IVC does not have a football team, a homecoming basketball game takes places instead. There is also an accompanying pep rally with free food and activity. Held Wednesday the week before Halloween, various clubs set up booths and offer snacks. There is also a Halloween costume contest. Clubs pick a country they want to represent for Multi-Cultural Day (usually held the second month of every semester) and on that day, provide food from that country. There are live performances as well. Irvine Valley College Athletics teams are known as the Lasers and have a rivalry with their district rivals at Saddleback College, with whom they compete for a perpetual trophy called The Irons. IVC sponsors intercollegiate athletics competition in 13 sports; women's badminton, men's baseball, men's and women' basketball, men's and women's golf, men's and women's soccer, men's and women's tennis, men's and women's volleyball and women's sand volleyball. IVC is a member of the Orange Empire Conference, widely regarded as the nation's premier community college conference, with the exception of men's volleyball (which participates as part of the Pacific Coast Athletic Conference), and women's sand volleyball (which plays as an independent and was the first community college in the nation to sponsor the sport at the two-year level). Irvine Valley men's soccer team has twice been named National Champions among small colleges (1993 and 2003) for Coach Martin McGrogan, and men's volleyball four times (1994, 2007, 2008 and 2011) among IVC Athletics' total of 17 state titles since the program's inception in 1993. The total includes IVC's most recent titles in women's golf in 2012 under Coach Ben Burnett, and the first-ever state championship in women's sand volleyball under Coach Tom Pestolesi in 2013. Badminton set a state record with four consecutive women's state badminton championships from 2002–2005 in addition to their latest state titles in 2009 and 2011, while men's volleyball team was the latest to capture back-to-back titles, winning State and National Championships under the direction of Pestolesi in 2007 and 2008. Misty May-Treanor is a consultant for the IVC volleyball teams. IVC Athletics' three state championships in 2010–11 represented the first time a non-football school had accomplished the feat in state history. The dance curriculum focuses not only on training the student who wishes to transfer to a four-year institution in dance or achieve an associate degree but also on providing opportunities for students in other fields to learn about dance. There are numerous opportunities for students of all levels and interests to perform by enrolling in the dance rehearsal and performance class or participating in one of the performing groups. The curriculum includes technique courses in ballet, modern dance, jazz dance, tap, social dance, Middle Eastern and African dance; an introductory course in various dance forms; Pilates and dance conditioning courses; and academic courses in choreography, music for dance and dance history. Many of these courses meet general education requirements in the arts, humanities, health and wellness, and cultural diversity categories. Participation in formal concerts is by audition and enrollment in the dance rehearsal and performance class. They film Go for It! at Irvine Valley College in 2011. Irvine Valley College has a five-year, $100 million building program.[when?] A new Performing Arts Center, designed by Arquitectonica, was dedicated on October 30, 2007. The venue has a 400-seat main theatre with a single-level balcony that wraps around the orchestra pit. The proscenium stage with an orchestra pit capable of rising to stage level accommodates large performances. The Black Box (Studio Theatre) provides a setting for plays and small concerts, with seating for 200. The project was funded by $32 million provided by the state of California and the South Orange County Community College District. A new $19 million Business Sciences and Innovation Center opened in 2008. Irvine Valley College is an Educational Alliance Partner of the Meade 4M Community, which supports the college's programs to educate the public in astronomy. Tom "Toulouse" Engelhardt, award-winning, internationally recognized guitar virtuoso and Environmental Science professor at IVC. Misty May-Treanor, Olympic beach volleyball gold medalist, and assistant coach for IVC's women's volleyball team. Toshio Whelchel, History professor, author of "From Pearl Harbor to Saigon: Japanese American Soldiers and the Vietnam War"
Massimo Mitolo, Electrical Technology Professor, author of the books: "Electrical Safety of Low-Voltage Systems", and "Laboratory Manual for Introduction to Electronics: A Basic Approach". ^ California, State of. "California Community Colleges Chancellor's Office - Data Mart". Retrieved August 27, 2016. ^ a b "Women's Volleyball Coaching Staff". www.ivc.edu. Irvine Valley College. Archived from the original on October 14, 2008. ^ a b "2018 Student Success Scorecard". scorecard.cccco.edu. Retrieved April 22, 2019. ^ "IVC News Release: IVC SET TO OPEN PERFORMING ARTS CENTER - August 3, 2007". Archived from the original on May 27, 2010. Retrieved April 21, 2008. ^ "IVC's building for the School of Humanities and Languages is being redeveloped". September 10, 2014. Retrieved August 27, 2016. ^ "News, reviews, interviews and more for top artists and albums – MSN Music". Retrieved August 27, 2016. This page was last edited on 22 April 2019, at 03:17 (UTC).